The University of Kerala was awarded the Chancellor’s Award for the best University in the State, an award that carries prize money of Rs. 5 Crores and a citation and a trophy. 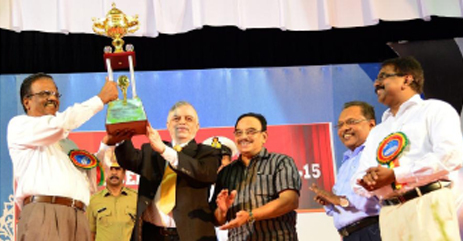 Governor of Kerala, Justice P. Sadasivam, who is also the Chancellor of the State Universities and who played the leading role in instituting this award, gave away the award in a glittering ceremony on 16 December 2015. Sri P.K Abdu Rabb, Honorable Minister for Education, Sri Ajith Kumar IAS, Secretary to Governor, Dr. N. Veeramanikandan, Pro-Vice-chancellor, took part.